The idea for these gorgeous Christmas cookies came one day while browsing through Martha Stewart’s website. When I saw them, I knew I had to bump off one of my other stories to showcase these cookies. Aren’t they adorable? Not only that – they are absolutely delicious. I know because I gave a little box to my sister to give my nephew to take to school. They looked so cute with the little melted candy in the middle mimicking the “stained glass” that I thought he would love them. In the middle of the day I received an email from her saying she gave one to Ben (my nephew) and the rest were taken by my brother in law (his father) to work! Talk about these cookies appealing to young and old alike! Sift the flour, salt, and baking powder into a large bowl and set aside. In an electric mixer, cream the butter and sugar together until light and pale and then add the egg and mix until smooth. Add the vanilla extract and then slowly add the flour mixture, a little at a time. Wrap the dough in plastic wrap and refrigerate for at least 45 minutes. 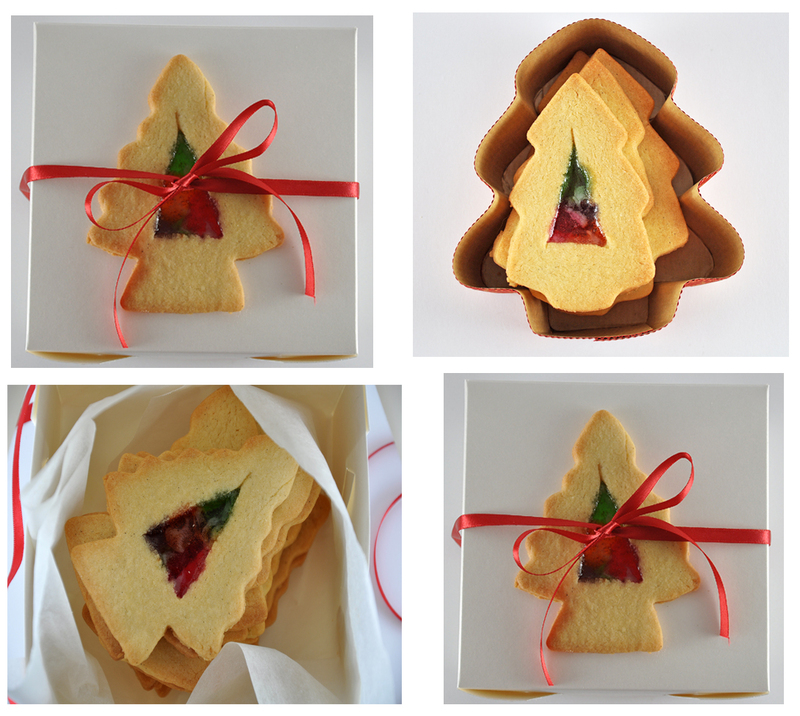 Roll out the chilled dough to around 3 mm thick and cut out shapes using a Christmas tree shaped cookie cutter. Transfer the cut outs to a baking tray lined with parchment paper. Space them around 5 cm apart. 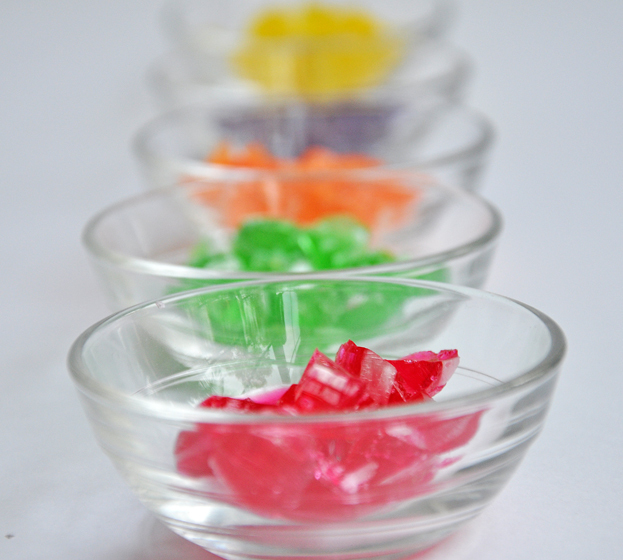 Using the tip of a sharp paring knife, make a triangular cut out and fill with the assorted hard candies. Chill the dough for 15 minutes. In the meantime, pre-heat the oven 160 c (fan forced). Once the dough is chilled, bake for 11 to 15 minutes until the edge are slightly brown. Let cook completely on sheets on wire racks. To package, I suggest you place the cookies in a plain white box and decorate the top of the box with another cookie. Otherwise, use a Christmas tree shaped disposable container. Hi we just saw your cookies and they look GRAET we r going to make them tonight I hope they look just like yours HAPPY HOLIDAYS. Triss, what kind of hard candy did you use and how did you chop it up? They look like round candies. I first saw the crushed candy idea way back in the 70’s in a Sesame Street activity book but never found the right cookie shape to maximize their cuteness, until now! Gorgeous!! Love the idea love the colors! on November 22, 2009 at 9:24 pm | Reply Tita Uko. These stained glass cookies look so pretty. I have some in my cookie book and am planning to make some soon. they are really cute Trissa – what type of candy did you use ?? wow….these cookies are just so beautiful and appealing to the eyes. What great cookies for Christmas! Trissa, you are just so creative! I really love them. I love all your bakes. The stained glass effect is so pretty, and the biscuit part doesn’t look to bad either. You come up with another great idea for Christmas giving! Waw,…these cookies look wonderful!! So tasty!!! Leave it to Martha. These are adorable, Trissa! They turned out perfectly- no wonder your brother-in-law took them all to work! Wow…that’s GORGEOUS! If I got that for a gift, I would seriously squeal my head off with joy! I was thinking of baking the same cookies!! Not as pretty though, with single colour stain glass. Luckily I checked twitter 🙂 Love your packaging idea. Have a great weekend! Thanks Ellie – great minds think alike eh? hehe! Trissa these are really pretty. 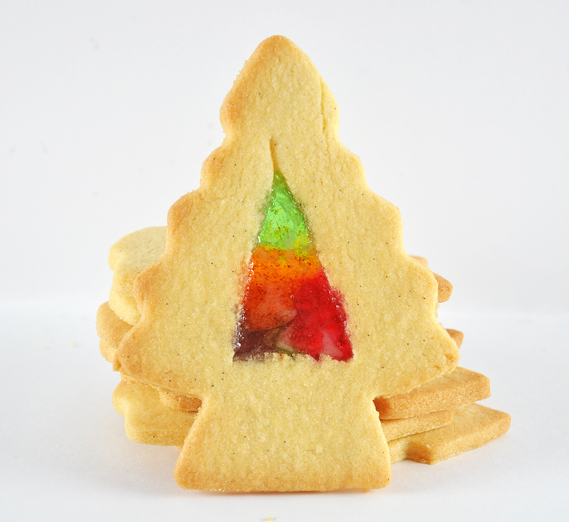 I love making stained glass cookies, but your’s are really nice. They look absolutely adorable! And you’re really into christmas already aren’t you? You even have a christmas header!! I am impressed!! And then I realize it is really only a month away. Wow… how did time get away from me like that?? Love the cookies! Does the center become hard or does it stay more jelly like? Thanks Simone – the center become hard – so it’s got a great crunchy texture. Same question my husband asked! yummy!!! the cookie looks very buttery! I made these labor intensive cookies one christmas to hang on the Christmas tree. They were beautiful to see with the lights behind, that is until the humidity came into play. The hard candies began to melt from the household humidity and all the center dripped out onto the tree. What a mess. They are beautiful cookies but need to be kept away from moisture. Agree with you Lona but luckily the cookies didn’t last that long as they were all eaten the next day! lol! These sound fabulous, but (oh no!) I can only see the second picture. Maybe its just my computer, but thought you should know! The ones I can see are adorable – love the many colours! Thanks Lauren for pointing it out! Does it work now? Yes! They look perfect =D. Aww they are so cute Trissa. I love Martha Stewart. I have her cupcake books. What lollies did you use in the middle. For the record, these were seriously yummy! I really loved the taste of the melted candies, I wondered what they were… very clever Tris! And once again, thanks for the treats!